Posted in: Meetings. Tagged: aas 229, cosmology, exoplanets. Figure from Gao’s talk, showing the spectrum of a planet before (blue and black lines) hazes and after (red line). The molecular features are almost completely wiped out by the hazes. 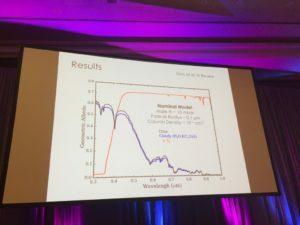 On day two of the AAS 229th meeting, I attended the morning session on exoplanet characterization and theory, which focused on atmospheric characterization. Several great talks, but one that made an impression on me was Peter Gao‘s presentation on sulfur hazes in hot Jupiter atmospheres. Gao discussed work from Kevin Zahnle at NASA Ames showing that UV photolysis can transform even small amounts of gaseous sulfur in a hot Jupiter’s atmosphere into significant amounts of polymer haze. Something that has become a running motif in exoplanet atmosphere studies, these hazes discombobulate the spectrum of light emerging from a planet’s atmosphere, completely masking the signatures of other atmospheric components. This is bad news if, say, you wanted to determine the composition of a planet using light reflected from its atmosphere. I Don’t know if you Exist But I Do! I bo not Agree with your Articl and I Do not Beleave that “MOMBO-JOMBO” if you do … Well! it’s Disturbing thought But I know How to Deal with it! I will Not let the Wolb Disiper under My Nose But if you Do I cant say I’m sorry! a ten year old who knows a little more than some Pepeol! ps. some peopl Have a little to Much time. Unfortunately, I had to depart for home shortly thereafter, so I’m missing the rest of the meeting. So here endeth my blog series on the meeting. Our fall semester at Boise State starts next week, though, and I plan to have weekly (maybe even semi-weekly) updates on the blog, so stay tuned.